In the summer of 1789, bread and other foods were scarce all over Paris. Talk of revolution filled the air as a financial crisis gripped the country. At Versailles, representatives of France’s classes, called the Three Estates, had been meeting since May to find solutions to the economic problems that troubled France. But in Paris, many poor citizens focused their anger toward the government on the Bastille, a prison fortress in Paris. For many the Bastille symbolized the King’s absolute authority. 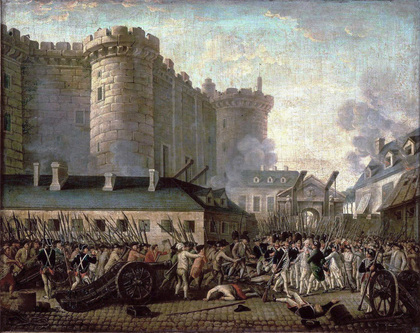 On July 14, 1789 a Paris mob stormed the Bastille, in search of large quantities of arms and ammunition that they believed was stored at the fortress. Also, they hoped to free prisoners at the Bastille, as it was traditionally a fortress in which political prisoners were held. However, at the time of the attack the Bastille was nearly empty of prisoners with only 7 being held. The Bastille was defended by 82 Invalides (soldiers who had been injured and could no longer fight in the field) and 32 Grenadiers. The commander at the time was Bernard-Rene de Launay. The crowd of Parisians numbered around one thousand and demanded the surrender of the Bastille and the removal of the arms and ammunition within. As the mob grew the undefended outer drawbridge offered an opportunity for the crowd to enter the courtyard of the Bastille. De Launay offered to surrender the Bastille if he and his troops would be allowed to leave unharmed, but the crowd replied, “No surrender! Lower the bridge!” Realizing that his troops could not defend the Bastille de Launay order the second drawbridge lowered. The mob swarmed into the inner courtyard of the Bastille armed with axes. The crowd ran to the prison cells and freed the 7 inmates. De Launay was grabbed and dragged through the streets by the crazed mob. He was horribly beaten by the mob and eventually beheaded. His head was then fixed on a pike and carried through the streets. Several other guards were killed as well, while other managed to survive the incident. To the common people in Paris, the Bastille symbolized the tyranny of the absolute monarchy in France. The fall of the Bastille signaled the beginning of the French Revolution and the role that individual citizens would play during the events of the revolution. In the diary of Louis XVI for the day of the storming of the Bastille, July 14 1789, he only wrote “nothing” which was a reference to his day of hunting.